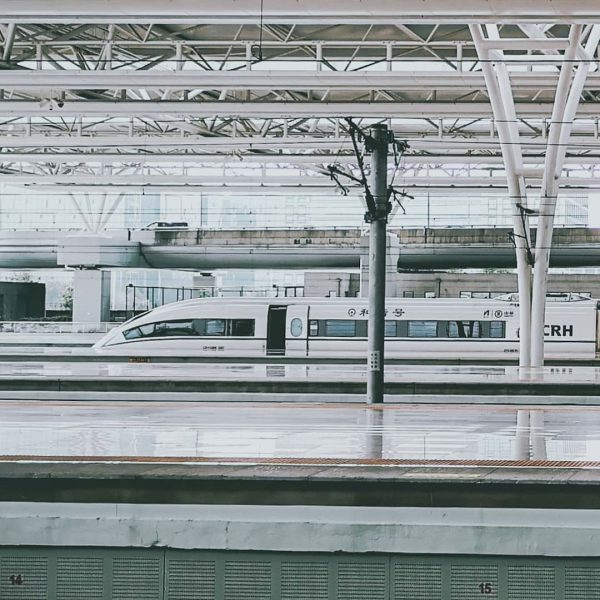 Always fun to use the train in China. Check-in at the Shangri-La Jing An. After a nice ride with the airport express train (455 km/h, wow!!!) we arrived. 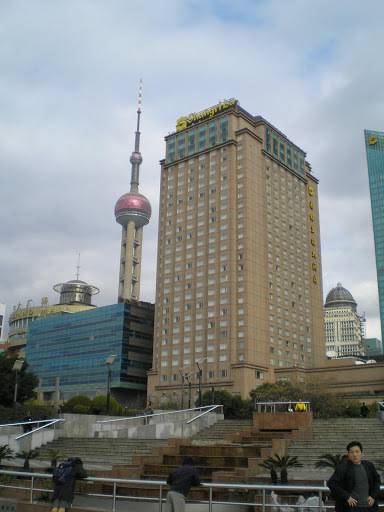 The hotel is located on the Puxi side of the Huangpu River. 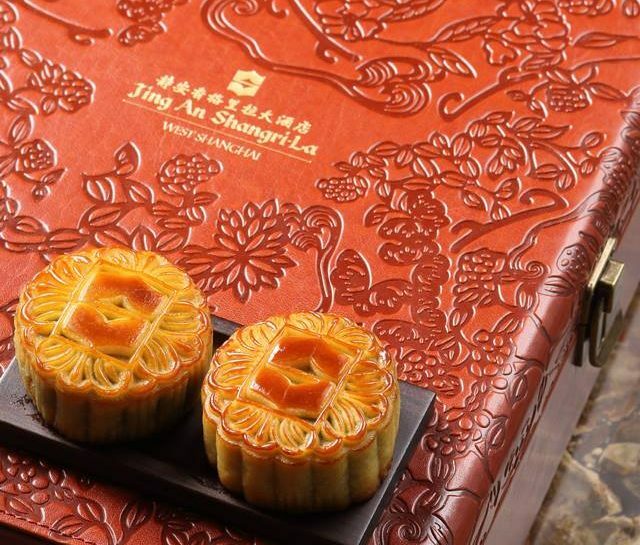 Jing An Shangri-La features a design inspired by Shanghai’s past, present, and future. The 508-room hotel is the centerpiece of the Jing An Kerry Centre. Upon entering the lobby, guests are greeted by a 19 x 10-foot oil painting by Zeng Fanzhione of two renowned contemporary artists who were commissioned to create pieces for the hotel. The other is Zhou Chunya, whose series of five paintings for Jing An are inspired by Shanghai’s Yu Garden. The Jing An Shangri-La’s art collection includes around 200 pieces by 50 artists, representing 12 countries. Fourteen of the 50 artists represented in the collection are Chinese. It includes sculptures, paintings, works on paper, photography, textile art, and decorative objects. Each work pays homage to Chinese culture. Hand-tufted silk carpets found throughout the hotel were designed to resemble paintings and take inspiration from traditional chinese watercolors, lotus, auspicious fish, and colorful blooms. The fantastic hotel is very Shanghainese, it is a balance of the new and the traditional. History: Shangri-La is a fictional place described in the 1933 novel Lost Horizon by James Hilton. 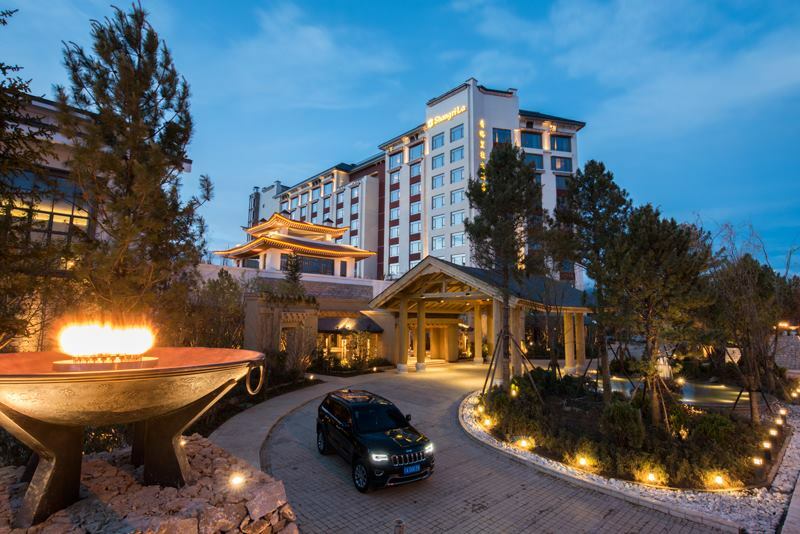 Hilton describes Shangri-La as a mystical, harmonious valley, enclosed in the western end of the Kunlun Mountains. Thats why Shangri-La has become synonymous with any earthly paradise, and particularly a mythical Himalayan utopia — a permanently happy land. The hotel’s four bars and restaurants reflect Shanghai’s eclectic and cosmopolitan nature. Summer Palace’s contemporary design takes inspiration from Chinese traditions with golden yellow, orange, green, and blue furnishings, and artwork and accessories inspired by the peacock. In the 1515 West, Chophouse & Bar, premium beef and American-sized desserts are served in a classic New York steakhouse interior. The Artifacts from Shanghai’s historic movie productions gives the place glamor. We saw already a few celebrities and enjoyed the crystals, more than four million crystals. The bling-bling crystals are used as architectural elements, from the thick canopy of lighted rods covering the porte-cochere to the drapery anchoring the double-height reception area and lobby lounge. Shangri-La hotels are alwyays fun and do not forget to read the book – the story behind “Shangri-La” by James Hilton. Its in one of the glorious 1920s colonial buildings, converted into an art gallery and designer shopping emporium, with four restaurants. The 7th floor roof terrace has a fabulous view over the river and Pudong. The restaurants are Laris, New Heights, the Whampoa Club, and Jean Georges (outpost of the New York chef Jean Georges Vongvichteren). On the top of the building is a little cupola, which has been cleverly converted into two private dining rooms, each with just one table. The upper cupula has a table for two, the lower one a table for up to eight. In these you can eat a menu prepared by any of the restaurants, or indeed even mix and match courses if you wish. We had lovely Sea Scallops and Lobster Tartine, Lemongrass, Fenugreek Broth, Pea Shoot. It was fantastic. The chef Jean Georges is fantastic and known for its use of spices with more classical dishes, and indeed this was on show tonight e.g. the lobster had very distinct spices. The Desserts were an excellent mix of chocolate dishes, including a fine chocolate fondant. Overall a yummy lovely exerience on the bund, the great thing here is the setting. YYou have the sense from this that it is a bit of an unusual novelty rather than a pure dining destination, but it is a seriously romantic setting. Tip #2: Absolutely my choice – the restaurant “Ultraviolet” !!! Must do. for around 400€ a dinner. A revolutionary 10-seat multi-sensory experience restaurant Ultraviolet. It will evoke a ‘bold and exclusive dining experience that engages all the senses to create the ultimate luxury. Ultraviolet, a sort of dress rehearsal for the final draft of the restaurant which has finally rolled out. And after this, admittedly invited, tasting, we can say definitively that yes, Ultraviolet is radical and it was very much worth the wait. Ultraviolet is located in a secret location in an old Shanghai neighbourhood. After being driven to the restaurant by their private driver, you enter a set of inconspicuous double doors and cross into Pairet’s fantasy restaurant: a mixture of James Bond lair and mad scientist laboratory. Mesh metal doors slide open without any visible human attendants. Your chilled drink awaits on a bar counter of raw wood. After a few sips, another door slides open, beckoning you down a hallway lit by a Baccarat crystal chandelier. Then, a final set of doors slides open. You can’t help but laugh as the 2001: A Space Odyssey opening chords play while you step into the all-white dining room: a plain rectangular table flanked by 10 white adjustable chairs. The dining experience begins. The full dinner includes 20 ‘avant garde’ courses, for other courses, many of which are paired with drinks ranging from dessert wine to peppermint tea, projections include crashing ocean waves, ancient trees in fog or Indonesian masks. A ‘micro fish and ship’ course is actually a single giant caper berry deep fried in batter and paired with anchovy tartar sauce. The food is central to the night, never just a prop; each meticulously crafted bite is so delectable, we’re left craving more after nearly every course.